Summer is here and that means our cats and dogs that have been lightly or moderately shedding as the temperatures have been rising will most likely go into what feels like overdrive shedding. You would think it’s their job to shed. I’ve started finding tufts of fur on the pet beds I have for my cats and little tumbleweeds of cat hair in the corners of the rooms. While I can’t prevent them from shedding, I can prevent hairballs and I can prevent my house from being overrun with fur. It takes some routine cleaning and regularly scheduled grooming sessions. Brush your pet regularly during these warmer days. It’ll remove loose and dead fur and help keep your house fur free. It’ll also make your pet’s coat softer, cleaner, and prevent hairballs. Your pet may benefit from a fatty acid supplement such as Vitacoat. It’ll help keep their skin and fur healthy. High quality pet food can create a shinier coat, cut down on shedding, and give your pet plenty of protein. Cover your car seats and furniture with throws to keep the pet hair off. Some fabrics hold pet fur more than others, some patterns and weaves of furniture allow pet hair to work its way into it. You may also want to invest in a vacuum that has attachments for upholstery to remove the fur that does get stuck on it. Wash pet bedding often to remove fur, remove odors, and keep your house fresh and clean. Vacuum and sweep often to keep fur from building up in the house. Be diligent. You may want to vacuum every few days, once a week, or whatever works best for your house. Bathe your dog (your cat too if you can) during the summer. A clean coat is a healthier coat and will help prevent dry skin. Brush your pet before and after the bath to remove dead fur. It’ll cut down on fur that ends up everywhere else. If your pet is ok with it, some vacuums have a pet tool accessory that lets you literally vacuum your pet. Get your pet a nice summer cut but make sure it’s not too short to expose skin to the sun. Your pet can get sunburned. 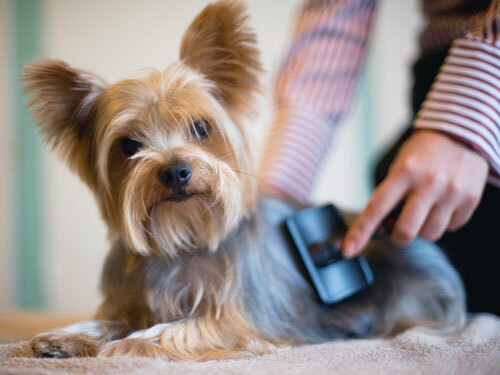 Grooming helps cut down on shedding and keeps their fur tangle-free, clean, and cuts down on fur on everything.